There wasn’t a new episode of Pretty Little Liars, so I finally got a chance to see last week’s episode. Each episode has so much fashion from the main girls. Here were some of my favorite looks from the episode. I love this shape on Spencer. It’s really boho, and I like that she gave the outfit more structure by adding this olive colored jacket. Pineapples are huge this summer, and I like that Hanna made the look very glamorous with the crop top and asymmetrical jacket. All the yellow touches were flirty and fun as well. Mona’s hair looked really pretty last night and it distracted me from her collared dress. I really like these kind of sleeves, which are billowy and have buttons on the cuffs. 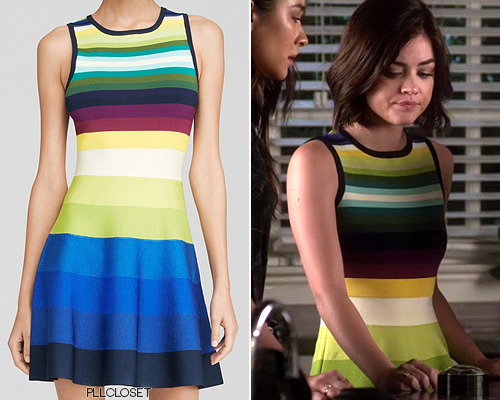 This dress really highlighted Aria’s tiny waist. It’s so colorful and I like the gradual change of colors throughout. On the season 6 premiere of Pretty Little Liars, we revisited some old fashion from the girls. I thought Aria’s was the most iconic, simply because of the pink streaks. The episode was scary throughout, and I personally loved the premiere. We didn’t get a ton of answers, but if the writers aren’t going to give us answers, they at least have me on the edge of my seat. I was afraid there wasn’t going to be any fashion when I saw them running in sheets, but luckily Charles had them wearing season 1 clothing. Their styles have all evolved, especially after seeing Emily in that sweat suit. 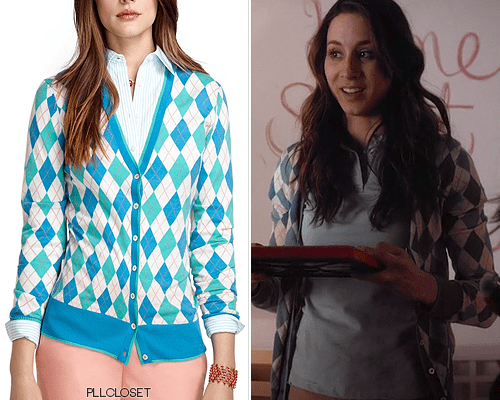 Thanks to PLL Closet for having the details on the clothing wore. 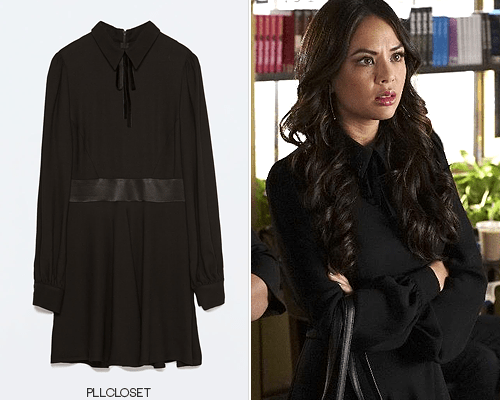 Check out her blog, where she updates the latest PLL fashion. I left the link below. Express ‘(Minus The) Leather Jacket’ – $128.00: This jacket would look really cute with a flirty fit and flare dress. 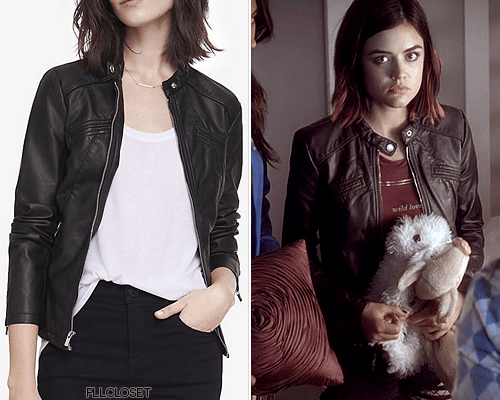 Aria always dresses edgy, but her style has definitely evolved over the seasons. She used to wear much more wacky colors and patterns, but she has toned it down quite a bit with neutrals. AG Adriano Goldschmied ‘Legging Ankle Jeans’ in Orange – $66.75: Hanna has had a more opposite effect from Aria. She used to wear girly blazers and skirts all the time. In season 5, I loved that she’d wear a romantic, soft look in one episode and a edgy, fun look in the next episode. Brooks Brothers ‘Saxxon Wool Argyle Cardigan’ – no longer available: Spencer’s style has probably changed the least. Her style has always been preppy, and I could see her wearing this cardigan now. It has Spencer written all over it. I also loved the oxfords she wore with this outfit. Pretty Little Liars only has a few more episodes until the season finale. Here were my favorite looks from the episode. 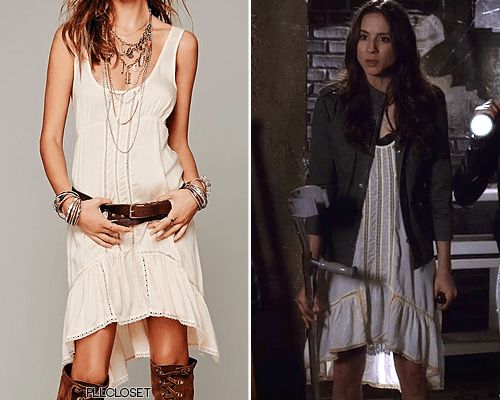 One was a jacket from Aria and the other was a dress worn by Spencer. At the end of the season, I’ll pick my favorite outfit of the season from each girl. For now, enjoy! 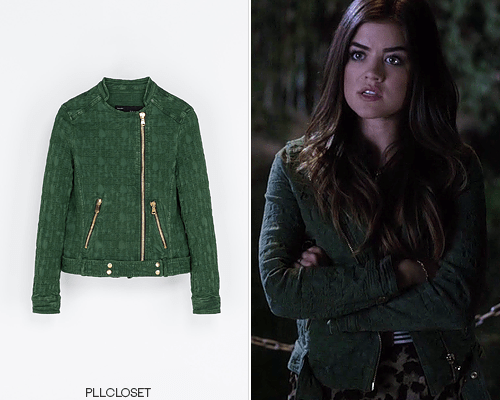 Thanks to PLL Closet for always having the latest details on the outfits. Follow her blog in the link below. Flying Tomato & Jealous Tomato ‘Jacquard Aztec Print Jacket’ in Black/Mint – no longer available: I can definitely see why this jacket isn’t available anymore. I love how modern the shape is along with the alternating blocks of white and mint tribal print. I love this piece for Aria. It’s very artsy and I couldn’t really see any of the other girls wearing this. Mason By Michelle Mason ‘Lace-Inset Slip Dress’ – $395.00: Spencer is finally wearing a cute little lace dress. All season, she’s been sporting menswear looks and jackets. This is definitely a departure from what Spencer usually wears , but in a good way. I like the loose waves and deep laced plunge. It gives Spencer a more fun, flirty vibe. 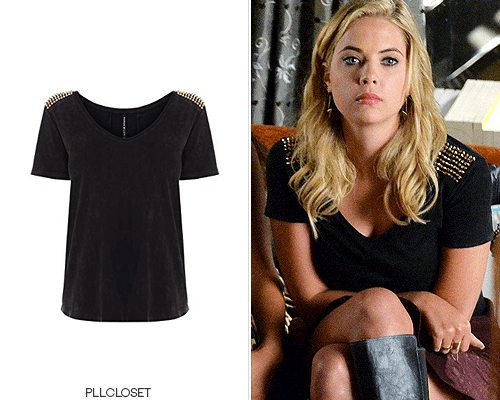 This dress would be something I expect from Hanna or Emily, so this was a pleasant surprise. If you liked this post, follow me. Have a great Wednesday everyone.